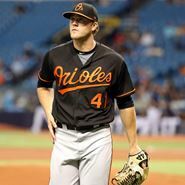 The Baltimore Orioles (16-34) head to Florida to start a three-game series against the Tampa Bay Rays (23-25) after winning two of four against the Chicago White Sox on the road. The Orioles have gone 3-5 so far during their current road trip but seem to be prepared to put their early-season misery behind them. After starting the 2018 campaign 8-27 they’ve now won eight of their last fifteen games. The Rays will host the Orioles after losing two of three against the Red Sox. After going 3-8 through their first eleven games in May, they’ve now won seven of their last 10 games. Note: Hess gave up five runs on eight hits over 4.2 innings during his latest outing in Boston. Romo this month has posted a solid 3.00 ERA and has held hitters to a .206 batting average over nine innings of work. Note: Over four starts this month, Cashner has gone 1-1 with a 4.64 ERA. Stanek owns a 5.76 ERA over 27 career appearances as a reliever since making his debut in May 2017. Note: Gausman has a 2.63 ERA over four starts this month, and has gone 2-2 with a sparkling 2.49 ERA over his last seven contests. Yarbrough has allowed just two runs over his last 11 1/3 innings. For the month of May, he owns a and a 3-1 record and a superb 2.95 ERA over 21.1 innings of work. Manny Machado is hitting .311 with six homers and seventeen RBI over his last fifteen games. Adam Jones is hitting .310 with four doubles, five homers, and ten RBI in May and has posted a .367 average with two homers and four RBI over his last seven games. Matt Duffy is hitting an incredible .382 (21-for-55) with one home run and seven RBI over his last 15 games. Wilson Ramos is hitting a whopping .385 with two home runs and six RBI over his last seven ballgames.